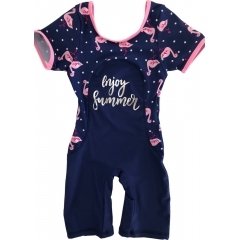 We are specialized in designing and manufacturing girls swimsuits.We also supply girls one piece swimwear,bikini bathing suits and cute baby's tankini swimming suits.We will give you the best product and price. Short Sleeve Rash Guards By Sun Smarties Offer Extreme Sun Protection, Covering Tummy, Back, Shoulders, And Arms. This Fashionable Toddler One-Piece Swimsuit Is Full Of Style And Practicality. She will be as cute as a flamingo in her one piece flamingo swimsuit. A great beachwear bathing suit for your sweet girl from Pink Flamingo. This cute 2 piece pink tankini swimsuit set has sliced fruit print allover. Perfect for the beach or pool! Lovely this bikini set,comfortable for little girls.